This is SO important! Once you start learning about chemicals and toxic ingredients, it’s hard not to want to swap everything ASAP. But don’t feel like you need to do this! Start small. When your mascara runs out, replace it with something better. Use up the rest of your foundation, then swap for a new one. Do it little by little, and that way you only have to spend money here and there instead of more money all at once. Trust me, it took me about 2 years to fully replace my makeup. You can do it too! If you’re having trouble prioritizing what to replace, start with the products that you use the most, such as deodorant, foundation, toothpaste, face wash, or shampoo. Or, ditch the products that are the most toxic first. To make your products last longer and in turn not spend as much money, try using your new “green” products every other day instead of every day. It’s still better than never using them! Then, slowly phase out the conventional products until you are green 100% of the time! There are different levels of “green” when it comes to beauty products. There are your conventional, cheap, toxic products. Then there are products that are so/so and have good ingredients as well as some bad ingredients. Then there are your SUPER pure products that are basically edible because they are so pure, but are on the expensive end. Find a middle ground. Maybe instead of buying that $45 clean foundation, you buy one that is around $25. It’s still WAY better than a cheap $4 foundation! See what I’m saying? Slowly work your way towards pure makeup. Baby steps are still steps! When you purchase a green beauty product, you are likely helping out a small business or even a single person. They are likely purchasing supplies or ingredients from someone local or another small business. You are helping a brand that wants to help you, instead of helping a brand that just wants your money and doesn’t care about what chemicals you’re putting on your body. Green beauty is more eco-friendly, more sustainable, and less taxing on the environment. Green beauty is great for people with sensitive skin because there aren’t any harsh chemicals. Maybe your old foundation was giving you a rash, so you had to buy some sort of cream to cover up the rash. Get where I’m going with this? Once your body no longer has to fight off impurities, you won’t need to buy products to counteract that! Paying more for a pure product now = paying less for medical bills in the future. Years and years of putting toxic chemicals on your body adds up. Don’t believe me? Watch this. It might be a harsh wake-up call, but organic beauty does cost more in general. But that’s because truly natural makeup does not contain cheap fillers and chemicals. You get what you pay for! A lot of green beauty brands sell sample sizes of their products, which is great if you want to try them first before committing to a more expensive full-size product (scroll down for links to samples). Try looking at Whole Foods or your local health store too, they usually have a “travel” section with smaller sample sizes of deodorants, toothpaste, lotions, etc. 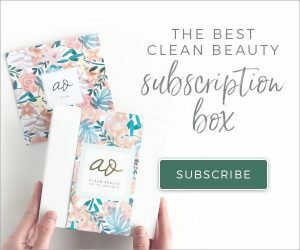 I also love subscription boxes, and there are so many of them out there. You pay a monthly or one-time fee and are sent a box of assorted products. A great way to try new brands and items! Check out this page for a couple of boxes that I recommend. Deals are everywhere, you just have to look! Looking at a certain product? Sign up for that brand’s newsletter and wait for a sale or promo code. Shop on sites that carry multiple brands such as The Detox Market or Citrine that usually have good deals. I have even seen products for a cheaper price on Amazon. You just have to look around! I also have a Deals & Promos page that is updated weekly. If I see any sales going on, I throw them on this page! It also has a list of promo codes. Just search for “DIY Green Beauty” on Pinterest (or check out my DIY Green Beauty board). There are SO many things out there that you can just make yourself such as lip scrubs, face masks, deodorant, lip gloss, foundation, eye shadow, etc. Probably anything you can imagine is able to be made at home, naturally. In general, green beauty products don’t use cheap fillers and therefore are more concentrated. Meaning, you get more bang for your buck and might not need to use as much of the product to get the results you want. Wearing less makeup is better for your skin, too. Let it breathe! I cannot stress enough how important it is to do your own research and learn about ingredients. Greenwashing is when companies use claims such as “natural” when really they are using ingredients that can be harmful and are in fact NOT natural. Don’t waste your money on brands that are tricking you into thinking their products are clean. They might even be selling a product for more money and upping the price just because they are trying to make you think you’re getting a higher quality product. Read ingredients instead of front labels that are just trying to persuade you. 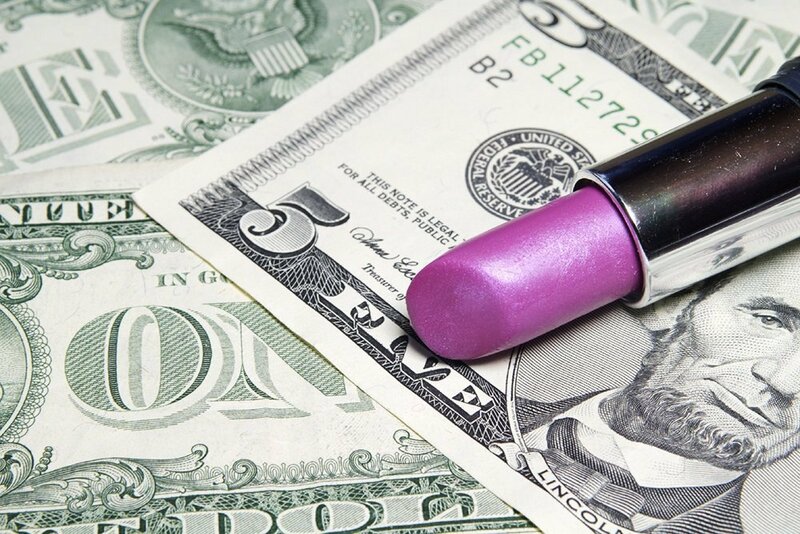 Ready to buy some green beauty products?!? I have a My Faves page that lists all of my favorite products and links to buy them. I also made a “Green Beauty Starter Pack” post featuring 12 essential everyday items. Also be sure to read my blog post 19 Green Beauty Brands That Offer Sample Sizes. 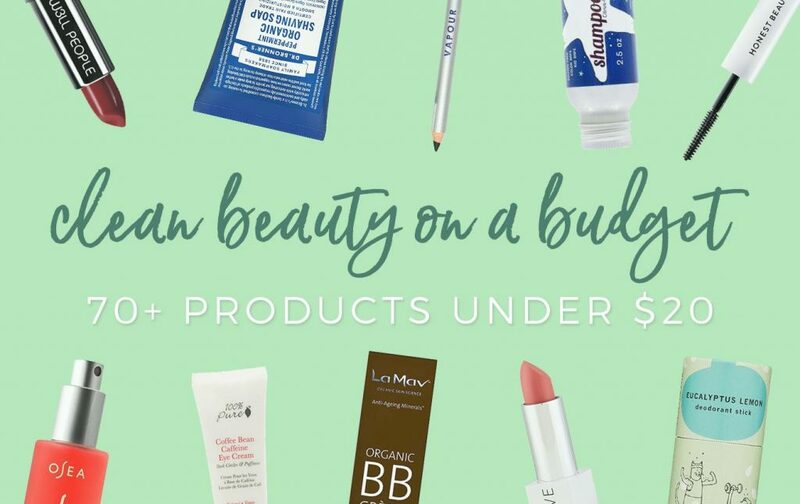 I even have a giant guide of 70+ Green Beauty Products Under $20 Bucks! At the end of the day, you get what you pay for. 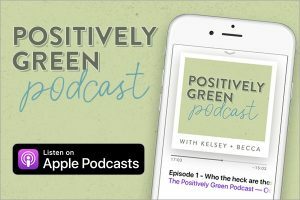 I really hope this post helps you to realize that green beauty is affordable if you do it right. It’s so worth it 💚 and your health should not be compromised for beauty. 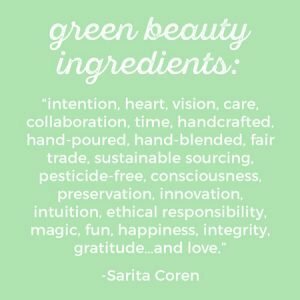 If you are looking to learn more about green beauty, I wrote posts about 5 Green Beauty Myths and 20 Toxic Ingredients to Avoid. Please let me know in the comments if you have any questions! Hi Becca! I loved this article and couldn’t have said it better myself. I completely agree with you on the “less is more” aspect. I am always looking at my expiration dates because my green products last so much longer. Great list of suggestion!! Hi Jennifer, I’m so glad you liked it! And you’re so right, there are foundations I have that last forever and are probably past expiration! Hey! I’ve been switching to some Shea Moisture products lately. So far, I’ve really liked them and my ingredients research isn’t coming up with much of anything hazardous. EWG has them rated pretty low but was wondering if I was missing something? Any experience with them? They’re reasonably priced and I’m loving the smells. Hi Stacy! I believe Shea Moisture recently got bought out by Unilever so there is some unease around that and whether or not the ingredients will be compromised. The ingredients they use aren’t the worst but I think it varies product to product, some might use synthetic fragrance if I’m remembering correctly. I’ve never used them myself just because there’s other brands I prefer!